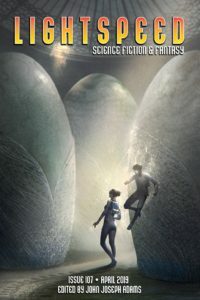 We have original science fiction by Caroline M. Yoachim (“The Archronology of Love”) and Matthew Corradi (“Gundark Island, or Tars Tarkas Needs Your Help”), along with SF reprints by Cory Doctorow (“To Market, To Market: The Branding of Billy Bailey”) and Michael Swanwick (“The She-Wolf’s Hidden Grin”). Plus, we have original fantasy by Ashok K. Banker (“The Seeds of War”) and Shweta Adhyam (“A Conch-Shell’s Notes”), and fantasy reprints by Carmen Maria Machado (“Blur”) and Carrie Vaughn (“The Lady of Shalott”). All that, and of course we also have our usual assortment of author spotlights, along with our book and media review columns. We also have an interview with Rebecca Roanhorse. For our ebook readers, we are reprinting the novella “The Speed of Belief,” by Robert Reed. You can also enjoy an excerpt from the novel Upon a Burning Throne by Ashok K. Banker.